The perfect, healthy Spring breakfast recipe is here!! This delicious Egg Whites Frittata is made with a lot of good for you ingredients, but the flavorful smoked gouda cheese is what really makes this Italian Omelet Recipe a real palate pleaser. With fresh spinach and dill, you’ll get some well needed fiber and antioxidants, and the lean ham and egg whites will pack in the protein. And the best part is – each serving is just 2 Points!! Wahoo!!! Even though this is not an official one of Weight Watchers Breakfast Recipes, anyone who wants is looking for a flavorful, but low calorie egg recipe will definitely enjoy this dish. Plus, isn’t it just fun to say you made a “frittata”?!? It feels so posh. Looking for a low calorie WW Breakfast recipe that still tastes great? 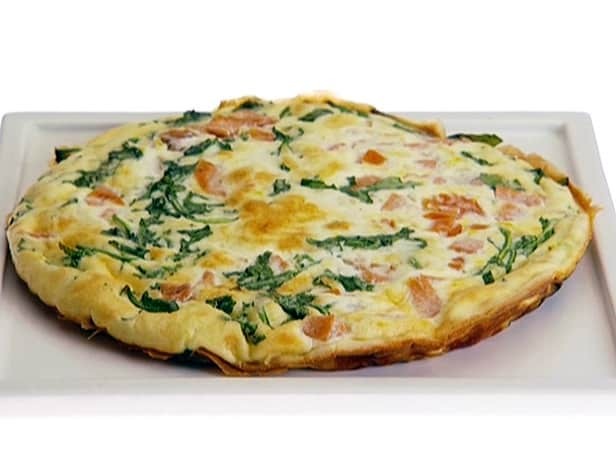 Well this delicious Egg Whites, Ham and Spinach Frittata will definitely fit the bill. Made with low calorie ingredients, it maintains a healthy profile, but still packs in some amazing flavors. Whisk egg whites, salt, pepper and garlic powder in a medium bowl. Spray a frittata pan or a large ovenproof nonstick skillet with nonfat cooking spray and set over medium heat. Add fresh dill lemon zest and leeks; cook, stirring, until softened, about 3-4 minutes. Add spinach and ham; cook, stirring, until the spinach is wilted, about 1 minute. Pour the egg mixture over the vegetables and cook, lifting the edges of the frittata so uncooked egg can flow underneath, until the bottom is light golden, 2 to 3 minutes. Sprinkle cheese on top, transfer the pan to the oven and bake until the eggs are set, about 8 minutes. Let rest for about 3 minutes before serving. Slice into 6 equally sized portions. I had friends over for brunch, and was looking for a light dish that I could cut into small pieces and serve- and this was perfect. I don’t eat red meat, so I substituted the ham for turkey slices and it worked great! I served it with cups of fruit and low fat muffins, and it was perfect. Thanks for the recipe! I made this for overnight guests. Everyone loved it. I will make it again but will not add salt. The cheese makes it salty enough. This is a keeper and will be used again and again. This was an amazing recipe! I went way overboard for lunch one day and I needed something good and low points….my whole family loved it. We will make it again!